Faculty and staff from the Department of Family Medicine’s (DFM) Integrative Medicine Program are partnering with the Veterans Health Administration (VHA) and the Pacific Institute for Research and Evaluation (PIRE) on a national initiative to transform how clinicians care for veterans and themselves. Through the program, “Whole Health: Change the Conversation,” they are traveling to 24 VHA hospitals nationwide to teach clinicians how to shift the culture of health care towards a whole health approach. In Fall 2013, the Whole Health team piloted the program at five VHA hospitals, including the William S. Middleton Veterans Hospital in Madison. In 2014, they will travel to 19 more VA health care facilities. 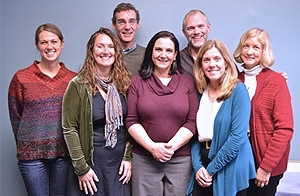 The Whole Health program’s core faculty are: David Rakel, MD; Adam Rindfleisch, MPhil, MD; David Kiefer, MD; Russell Greenfield, MD; and Christine Milovani, MSW, LCSW. At each location, they teach a two-and-a-half day course that offers clinicians an opportunity to experience what whole health looks and feels like. “We first ask participants to personally explore whole health for themselves, tapping into eight components of proactive health ranging from “Food and Drink” to “Spirit and Soul,” while eliciting what might best support their own goals for whole health,” Dr. Rakel explained. Participants also learn through direct experiential exercises and relevant research that supports the whole health approach. On the final day, they develop practical implementation strategies for their own clinical work, for their interdisciplinary teams and for the facilities in which they work. Clinical priorities focus on posttraumatic stress disorder, depression, sleep disorders, pain, and substance use—some of the biggest health challenges facing veterans. A corresponding online curriculum—in development under the leadership of Dr. Rindfleisch and with contributions from 25 subject matter experts—will complement the programs. “It has been a pleasure to collaborate with colleagues, including many of our current and past integrative medicine fellows. I am excited to see everyone share their expertise in a way that has the potential to shape health care for millions of people,” Dr. Rindfleisch said. An explanation of the “Whole Health: Change the Conversation” program goals can be found in the two parts of its title, said Project Manager Marité Barham, MPH, CAEH. “The concept of ‘whole health’ is about transforming the culture of the health care system to embrace the whole person, as opposed to a disease-oriented model,” she explained. According to Barham, national VHA leaders are also participating in the courses, cultivating a larger community of clinicians focused on whole health. PIRE, which was awarded the VHA contract to helm this training program, selected the UW Integrative Medicine Program as a subcontractor to lead the project because of its outstanding reputation for research and clinical expertise. The Integrative Medicine Program’s online educational modules and clinical tools, which have been developed over the past 11 years, are well received by both clinicians and patients around the world. “The VHA was looking for educators who were grounded in integrative medicine and the foundations of health and healing,” Dr. Rakel recalled. The “Whole Health: Change the Conversation” project is supported by the Pacific Institute for Research and Evaluation with funding from the Veteran’s Health Administration.